Also, I bought a motorcycle today! It's an '87 Sportster. Now all I need to do is learn to ride a bike again. It's been years since I've been on a motorcycle. 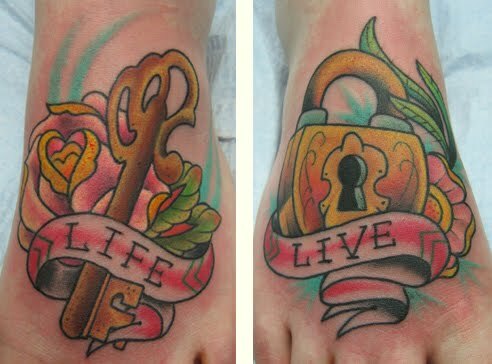 I did these fun neo-traditional foot tattoos of a lock and skeleton key on a pair of room-mates this week. We had a good time and the tattoos came out cool, if I do say so myself! 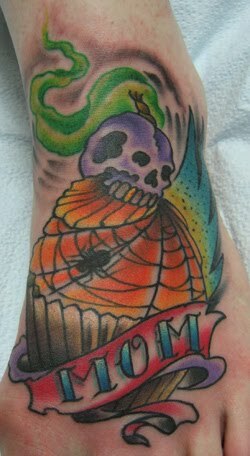 I also got to tattoo this awesome cupcake skull design on a foot this week. I was the foot guy at Adrenaline this week! We got the new Sailor Jerry Flash Book, Vol. 3 in the shop this week. I love tattooing all that old timey flash, so come on down to Adrenaline on Tuesdays through Saturdays and get some fun traditional flash tattoos! They're bold , look good and hold the test of time.